Captain Australia contacted my blog to spread the word about his work. He is not a conventional interview for this blog, but he is a blogger, he is trying to get the word out by contacting bloggers about his work and he is serious about his work. Captain Australia tell me about your blog and what you are doing? I use my blog to keep a public journal of my experiences as a masked crime fighter. In September of this year, I decided to assume the identity of “Captain Australia”, and set out to fight evil. That’s essentially my goal, to fight evil in all it’s forms, criminality, deceit and apathy. The blog sets out my experiences and invites open participation from visitors, in the hope that my example will inspire others. I’ll start by saying this: I am not insane. (Of course, most people who use that phrase can be relied on to be barking mad lunatics). 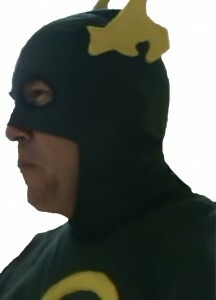 I am sincerely committed to being the masked hero, Captain Australia. Credibility is something that I have thought about alot, and I’ve posed this question to myself a number of times in my journal, the excerpt below pretty much explains where I stand, but it’s definitely not a hoax, not a game or a joke. I’m concerned about my credibility, and I want you to understand that this is not a joke. I believe that society is slowly eating itself, but the cannibalism is reversible. I am putting my own personal safety on the line, making a stand against this slow erosion of social values. I’m trying to fight crime, depression and apathy: I am trying to be your hero, and I am completely serious. Captain Australia why did you start your blog and who do you want to communicate with? As I worked out my mission, I realised that being in the public eye was important, as was gaining credibility, making people understand how deeply serious I am about what I’m trying to do. That’s why I keep my journal public – it contains all my worries, thoughts and musings. I’m on a Quest, but I don’t have a map: my journal also helps me adjust my moral compass, and work out which path to take. (And hopefully invites readers to give me advice, or share information on criminal activity). What kinds of feedback do you get via your blog? Captain Australia you contacted me for an interview, tell me more about your blogger outreach program? You’re probably giving me too much credit there, Murray. I’m not interested in money, so my basic goal is to spread my message, and as I’ve noticed people visiting my journal from around the world, I’ve realised that I should not just focus on my home city. Although to fight crime I need my strength, agility and martial skills – to inspire people, and to share my ideals – all I need is a computer and an internet connection. So basically, I’ve been browsing around, and participating in online dialogue in blogs that I like, trying to spread my message. I won’t compromise my secret identity by giving too much detail, but I’d actually looked at your blog previously, out of professional interest: so I thought I’d reach out. How successful has your blogger outreach program been? Well, as the Carpenters once sang “We’ve only just begun…”. I have noticed that since doing some active blogging this weekend, I’m attracting about 20 additional visitors per day. So I think I’m on the right track. Do you use any social media monitoring tools such as Google alerts? Actually, no. I’m trying to learn as much as I can, to be as effective as possible (while at the same time balancing some intensive physical training, my alter-ego working life, my home life, and a night study course I’m doing on first aid). With respect to the internet, I’m kind of learning as I go – so far I’m using my Blog, YouTube, Twitter & Google Analytics. What have you found works best when contacting bloggers? I don’t have enough experience yet to say. As I browse around, I’ll be honest: I see a lot of superficial regurgitation. I’d theorise then, that in order to get a result, you should base your online communication just as you would your RL : be genuine and honest – try to cut through the bull. I’d be very happy to engage anyone who is interested in what I’m doing, I’m interested to take on-board all feedback, positive and negative. Anyone who looks at my blog/journal will see that I’m working this out as I go along, and often grapple with trying to find the best approach. Learn about my mission. If it resonates with you – spread my message. If you know Captain Australia Real Life Superhero or your life has been affected by him in any way I would love to hear from you. Do you know know who he is?